Facelift (Rhytidectomy) – Michael S. Fozo, M.D., F.A.C.S. Maybe you’re 55 years old, feel 35, but look…75. Customized Facelifts by Dr. Michael Fozo in Macomb, Michigan, can help you look as great as you feel. And you deserve it. Our Facelift procedures are not cookie cutter. There are many different types of Facelifts, and Dr. Fozo will work closely with you to determine what will best help you achieve the look you desire. Most importantly, you will look naturally radiant and rested — never overdone or pulled tight. In fact, we hope no one can even tell you have had a facelift at all. They will simply know you look great. Your skin and underlying tissue become less elastic as you age, sagging around the jaw line or hanging loose on the neck. In such circumstances, a Facelift, also called a Rhytidectomy, can dramatically smooth the skin, re-suspend the underlying tissues to where they were when you were younger, taking years or decades off of your appearance. While other procedures can smooth surface wrinkles, only a Facelift can tighten sagging facial skin, jowls, double chin and loose neck skin. It is important to keep in mind that a Facelift reshapes the lower one-third of the face, while eyelid surgery and a browlift address the eyes and forehead. 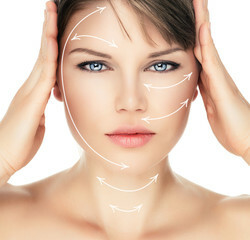 Facelift incisions vary and are an important part of the Facelift consultation. The incision in front of the ear can be hidden in front of or behind the tragus (a small piece of cartilage in front of the ear canal). After your consultation, Dr. Fozo will discuss the relative merits of pretragal incisions and post-tragal incisions. Minilifts, or short scar Facelift incisions will end on the posterior surface of the ear, just above the ear lobe. These incisions are most appropriate for patients with only moderate laxity who do not need a great deal of tightening in the neck area. If there is significant laxity of neck skin, then the postauricular incision (the incision behind the ear) will typically travel further into the hairline behind the ear. Many of our patients choose to further enhance the results of their Facelift by selecting ancillary procedures such as fat transfer, chin augmentation, cervical liposuction and chemical peels. Results can be dramatic and help you to look years younger, but is a Facelift right for you? Describe your specific expectations, develop a good relationship with your physician and do your homework. At Lakeshore Facial Plastic Surgery, we understand that elective surgery is a big decision. We take the time – first and foremost – to listen to your specific needs. Recommendations and treatment plans are tailored to your unique goals. Before you leave your appointment we will ensure all of your questions are answered, discuss costs and review potential surgery dates. You will also receive pre- and post-operative instructions on how to prepare for your Facelift, and how to properly care for your incisions once you are home. Your comfort and satisfaction — both before and after surgery — is of utmost importance to us. We are also available by phone should you have any emergency questions in between your follow up visits. To learn more about Facelifts or to schedule a consultation with Dr. Fozo in Macomb, Michigan, please call our office at 586-286-6565. We look forward to meeting you!